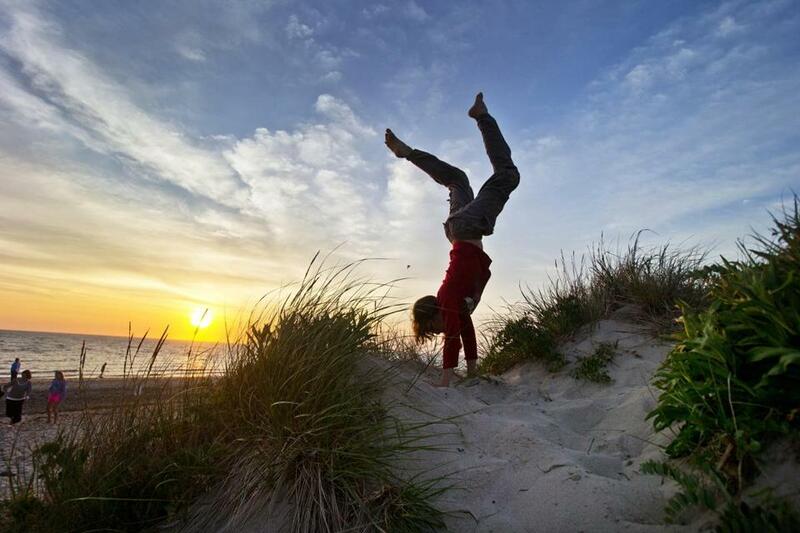 A handstand in the dunes of Wellfleet by Damon Wolf, 13, of New Paltz, N.Y. captures a quintessential Cape Cod moment. There are 15 towns in Barnstable County, which covers all of Cape Cod, from the Bourne Bridge, to the tip of Falmouth to the stone jetty in Provincetown, and there are 15 weekends between Memorial Day and Labor Day. What a coincidence! Here is a handy, alphabetical guide for the spring and summer, 15 perfect days for 15 Cape Cod towns, whether you want to bike, bum around, or beach it. With villages ranging from rustic West Barnstable to busy Hyannis, the Town of Barnstable has the proverbial something for everyone. Start by picking up pastries at Pain D’Avignon (15 Hinckley Rd., Hyannis, 508-778-8588, paindavignon.com). Then drive to the Sandy Neck Beach Gatehouse (425 Sandy Neck Rd., W. Barnstable) for the Monday morning 9-11 a.m. Sandy Neck Wildlife Hike with an Audubon naturalist. (They run Mondays until Aug. 29.) You might spot rare shorebirds and terrapins. Call Long Pasture Wildlife Sanctuary 508-362-7475, ext. 9353, to reserve a spot. Next Saturday and Sunday, the Hyannis Summer Arts & Crafts Festival takes over the village green with vendors selling crafts and gourmet foodstuffs while live entertainment streams from the bandstand. Events aside, one must-visit in downtown Hyannis is the John F. Kennedy Hyannis Museum (397 Main St., 508-790-3077), which preserves the legacy of the Kennedy clan, their public service, and their intimate connection to Cape Cod. Behind the museum, follow the Walkway to the Sea to the waterfront. Along the way, the Cape Cod Maritime Museum (135 South St., 508-775-1723) displays Cape Cod’s largest scrimshaw collection and has an exhibit on Cape Cod boat-building. Continue strolling the shore to the HyArts Artist Shanties (Hyannis Harbor, 508-862-4678.) Painters, sculptors, potters, glassblowers, and other artists demonstrate and sell their work in these seven waterfront shanties. While you’re at the waterfront, sign up for a sunset and cocktail cruise aboard the catboat Eventide (146 Ocean St., Hyannis, 508-775-0222). This sightseeing trip through Lewis Bay to Pine Cove Wildlife Sanctuary is especially good for birders. Afterwards, follow the locals around the harbor to Baxter’s Boathouse (177 Pleasant St., Hyannis, 508-775-4490) for top-notch fish and chips. A roundup of the best Cape and Islands restaurants, ice cream shops and places to have a drink and enjoy the coast. 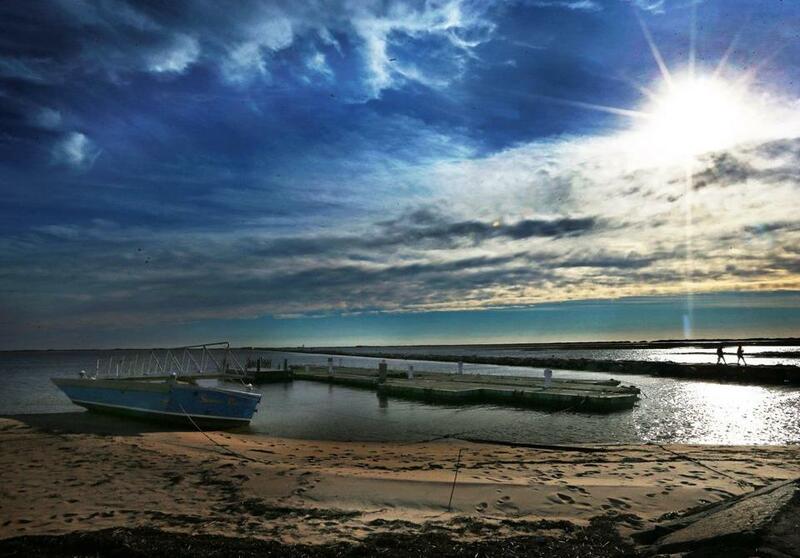 Read: What is it like to live in Provincetown? On Thursday, take in some Cape Cod Baseball League action. The Hyannis Harbor Hawks host the Brewster Whitecaps at 6 p.m. in McKeon Park (120 High School Rd., Hyannis), while the Cotuit Kettleers host the Yarmouth-Dennis Red Sox at 5 p.m. at Lowell Park (10 Lowell Ave., Cotuit). Cyclists can walk their bikes across both the Bourne and Sagamore bridges. But the Cape Cod Canal Railroad Bridge gets all the attention. The center span of the immense vertical-lift bridge is usually up to let ships with high masts pass, but it’s lowered with cables and counterweights when the Cape Cod Central Railroad dinner trains and the weekend Boston-Hyannis CapeFlyer cross the canal. Near the bridge on the mainland side, the village of Buzzards Bay is the commercial center of Bourne. Visit the Marine Animal Discovery Center & Gift Shop (120 Main St., Buzzards Bay, 508-743-9888) to see how stranded seals and turtles are rehabilitated. To cool off, the bike path follows the canal east all the way to Sagamore Beach (Standish Rd., Sagamore) or to adjacent Scusset Beach State Reservation (Scusset Beach Rd.) on Cape Cod Bay. The beaches on Buzzards Bay are usually less busy and more sandy. On the Cape side of the canal, the broad sandy stretch of Monument Beach made the area a resort in the 1880s. Sunset views are great from the beach—but even better from the terrace of the Sunset Grille (11 Brigadoon Rd., 508-743-0705) at Brookside Club golf course. Brewster’s eight beaches on Cape Cod Bay are so shallow and so gradual that you can walk out nearly a mile at low tide—and wade nearly that far at high tide. Start the day at Breakwater Beach (off Breakwater Rd.). If the tide is out, you can explore tidal pools for shells, crabs, and small fish. If the tide’s in, enjoy the mild temperature of the water that’s rushed in over the sun-warmed flats. There’s no snack bar here, but a half-mile up the road, the venerable Brewster Store (1935 Main St., 508-896-3744) stocks fresh coffee, penny candy, fudge, and Coke in real glass bottles. It’s also the go-to store for oil lamps and parts, including hurricane globes. Serious swimmers should head to the kettle ponds of Nickerson State Park (3488 Main St., 508-896-3491). Best bet is Flax Pond, where there are no sharks, jellyfish, motor boats, or even waves—just crystalline fresh water and a sandy beach. The Cape Cod Rail Trail bike path also cuts through the park, should you want to pedal in the woods. Hiking trails around the Cape Cod Museum of Natural History (869 Main St., 508-896-3867) are great for seeking out birds, frogs, and even salamanders. This coming Tuesday morning, naturalists lead hikes to explore life on and below the Brewster sand flats in a program called “Mudflat Mania.” Field guides are sold at the museum. For evening entertainment, the Cape Rep Theatre (3299 Main St., 508-896-1888) is performing the Broadway musical “Hairspray.” On Thursday mornings in the summer, Cape Rep also presents a one-hour show by Pitter Patter Puppets primarily geared for ages 2-6. Chillingsworth Restaurant (2449 Main St., 508-896-3640) is an institution for haute French dining, but you can also relax with casual bistro fare in the greenhouse area called Chill’s Bistro and Bar. Lighter fare includes panko-crusted fried oysters, lobster bisque, or the warm crab crepe with a garlicky tomato sauce. Chatham has one of the most idiosyncratic shopping districts on Cape Cod. The nostalgia-packed Ben Franklin Store (631 Main St., Chatham, 508-945-0655) echoes the five-and-dimes of yesteryear. For more than 20 years, artist Jenny Bovey has been translating ink prints of local fish into clothing at Blue Water Fish Rubbings (505 Main St., 508-945-7616, bluewaterfishrubbings.com). To appreciate the abstract beauty of Chatham’s shore, see it from the air at Kelsey-Kennard Photo Gallery (4 Seaview St., Chatham, 508-945-1931), which sells breathtaking aerial images of Cape Cod. Chatham Lighthouse Beach starts below the 1808 Chatham Light station and stretches for miles to the south. Swimming is allowed near the lighthouse (unless a red flag is flying), but forbidden farther south, where seals haul out on the beach and great white sharks cruise the waters just offshore. Now that fall migrations have begun, birding is spectacular. Harding’s Beach (Harding’s Beach Rd.) in West Chatham has gentle waves and much more parking. You can hike from the bathhouse about a mile to Stage Harbor Light—or just plunk down near the water and build a sand castle. The huge numbers of seals on Chatham beaches have drawn record numbers of great white sharks to these Cape Cod waters. To learn more about this often maligned species, see the interactive exhibits, videos, and displays at the Chatham Shark Center (235 Orleans Rd., North Chatham, 508-348-5901). The new Chatham Wine Bar (359A Main St., 508-945-1468) offers light food and 16 wines by the glass. Vegetarians might opt for the cranberry, wild rice, and hazelnut burger, while carnivores will prefer the cheddar cheeseburger with bacon jam. For evening entertainment, catch a first-run film or art house flick at the restored Chatham Orpheum Theatre (637 Main St., Chatham, 508-945-0874), which originally opened in 1916. Just about dead center on Cape Cod, Dennis spans the width of the peninsula with 16 beaches distributed between tranquil Cape Cod Bay on the north side and the lapping waves of Nantucket Sound to the south. You must start the day surveying the north shore from Scargo Tower (Scargo Hill Rd.). The bird’s eye view from atop the 30-foot-high cobblestone tower takes in the rim of Cape Cod Bay from Plymouth to the curling digit of Provincetown, and it’s one of the best views anywhere on the Cape. If you have small children, opt for beach time on Cape Cod Bay. Cold Storage Beach (Cold Storage Road, East Dennis) tapers gently into the ocean, guaranteeing calm water and abundant flats. No small kids and feeling more adventurous? If you’d rather fly a kite or windsurf, head south to breezy West Dennis Beach (Davis Beach Rd., West Dennis), where the west end is dedicated to kite flying. Known by drivers as the place where Cape Cod turns north and the speed limit drops to a radar-enforced 40mph, most of Eastham east of Rte. 6 falls into the Cape Cod National Seashore. A perfect day in Eastham is a day in and near the water. Start at the Seashore’s Salt Pond Visitor Center (50 Nauset Rd., 508-255-3421) where the short film, “The Sands of Time,” explains how Cape Cod was formed. The center’s museum touches on whaling, lifesaving, and lighthouses, but its newest and largest exhibit is devoted to Wampanoag culture and history. Two miles south off Rte. 6, signs lead to Fort Hill Trail, an easy 1.5-mile walk with panoramic views of Nauset Marsh. Near the parking lot, the Edward Penniman House with its whalebone arch gate was built in 1868 by an Eastham man who hunted whales from the Arctic to the South Seas. Tours of the house are offered Monday and Friday at 11 a.m.; reserve at Salt Pond Visitor Center. Most Eastham beachgoers take the Seashore shuttle to magnificent Coast Guard Beach, but if you drive a mile north up Ocean View Drive, Nauset Light Beach has similar stretches of sand for sunning and rolling waves for swimming and body-surfing—plus its namesake lighthouse. Bring a bag of Cape Cod Potato Chips to compare the illustration with its model. The tower (painted red and white in the 1940s) was moved from Chatham in 1923 to replace the original wooden Three Sisters lighthouses, now decommissioned and sitting in the woods above the parking lot. Free tours of Nauset Light are offered 4:30 p.m.-7:30 p.m. Sundays through the summer, and also Tuesdays and Wednesdays in July and August. With its barnyard-themed mini-golf course and 5,000 square feet of taffy, T-shirts, mugs, and silver bangles, the Cape Cod Gift Barn (4180 Rte. 6, 508-255-7000) provides a commercial complement to the day on the National Seashore. Play a second round with a pirate theme—and have a jumbo lobster roll—at Arnold’s Lobster & Clam Bar (3580 Rte. 6, 508-255-2575). Falmouth’s triangular Town Green is one of the prettiest on Cape Cod, surrounded by one-time homes of well-to-do merchants and sea captains. Main Street also has some of the Cape’s best clothing shopping, including the home-grown chain Puritan Cape Cod (199 Main St., 508-548-0116) and the chic Maxwell & Co. (200 Main St., 508-540-8752). When you’re done ogling the real estate and shopping, head a few blocks south to Locust Street to pick up the Shining Sea Bikeway, a portion of which follows a 3.3-mile rail bed to Woods Hole. The distance is short, so you don’t have to rush. Stop at Oyster Pond to watch the ducks, wild swans, and herons. Then take a short detour to stubby Nobska Light for sweeping views of the passage between Martha’s Vineyard and the mainland. Woods Hole is world-famous for marine science, anchored by the National Marine Fisheries. NMF’s Woods Hole Science Aquarium (166 Water St., 508-495-2001) has tanks filled with more than 140 species of marine life, but the seal feedings at 11 a.m. and 4 p.m. are the inevitable crowd-pleasers. Free tours of the Marine Biological Laboratory make the connection between humble sea creatures such as horseshoe crabs and whelks and the medical and biological research done here over the years by more than 50 Nobel laureates. Reserve for weekday tours at 1 p.m. and 2 p.m. (127 Water St., 508-289-7623). 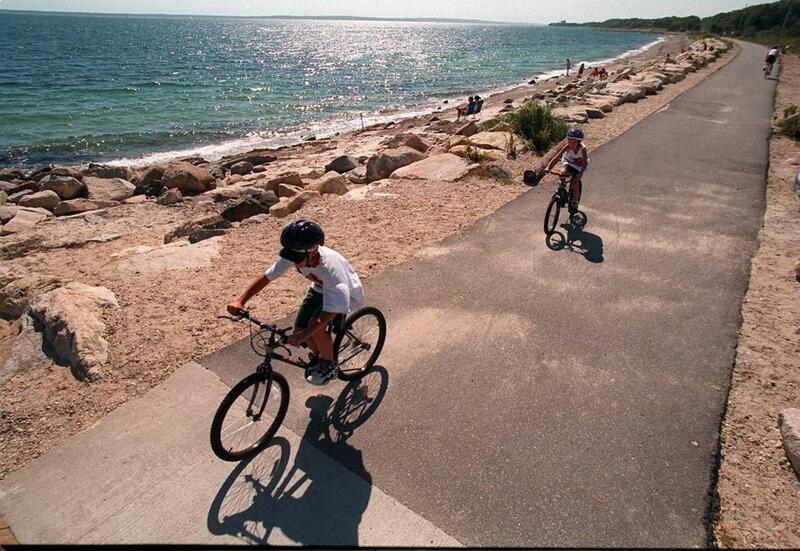 Shining Sea Bikeway, which runs along Vineyard Sound between Falmouth and Woods Hole. Ruggie’s Breakfast & Lunch (707 Main St., Harwich, 508-432-0625) is a local favorite for omelets and breakfast sandwiches. Just around the corner, the Harwich Historical Society’s Brooks Academy Museum (80 Parallel St., Harwich, 508-432-8089) last year opened the reconstructed Elmer Crowell Barn. Crowell (rhymes with “roll”), who died in 1952, was one of the all-time master bird carvers. His carvings often fetch more than $1 million at auction. The paint-spattered workshop recounts his life and work with audiovisual and photographic displays. A short distance north on Rte. 124, the Cape Cod Lavender Farm (41 Weston Woods Rd., Harwich, 508-432-8397) has both an enchanting formal garden and serene fields of lavender. With more than 14,000 plants, it’s one of largest lavender farms on the East Coast. The annual harvest is just finished, so lavender products are aromatically fresh. The busier side of Harwich is Harwich Port, strung out along Nantucket Sound around Rte. 28. Stop at Dr. Gravity’s Kite Shop (560 Main St., Harwich Port, 508-430-0437) for an impressive seven-foot-long shark kite or a convenient “keychain kite” and winder that fold up into a case that fits in the palm of your hand. To further prepare for the beach, drive up to Cape Cod Beach Chair Co. (1150 Old Queen Anne Rd., Harwich, 774-237-7313) to buy folding beach furniture so solid that the pieces become heirlooms. To see seals basking on the beach, book a 90-minute cruise with Monomoy Island Excursions (702 Rte. 28, Harwich Port, 508-430-7772). The on-board naturalist will also point out other wildlife—probably including sharks also looking for seals. Late in the afternoon, the crowds will have thinned at Atlantic Avenue Beach (off Ocean Ave., Harwich Port), making it a perfect spot to set up your new beach chairs and fly your new kite. 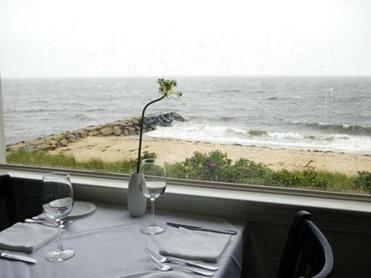 At day’s end, eat dinner at the elegant Cape Sea Grill (31 Sea St., Harwich Port, 508-432-4745). Try the grilled yellowfin tuna with a Moroccan spice rub. Established as a “praying village” in 1670, Mashpee is the ancestral home of the Mashpee Wampanoag and headquarters of the modern tribe. The Mashpee Wampanoag Museum (414 Main St., 508-477-9339) occupies a classic half-Cape built around 1793 adjacent to the Mashpee River and the Herring Run. Outside is a traditional round bark-covered Wampanoag house. Inside, the museum tells the tribal story from antiquity to present, including an exhibition on Native American whaling. The beech forest at the Lowell Holly Reservation (S. Sandwich Rd., 508-636-4693) has grown relatively undisturbed for the last 200 years, making it one of the few natural woodlands remaining on the Cape. Carriage roads skirt the Mashpee and Wakeby pond shores and hiking trails crisscross the Conaumet Neck peninsula. If the small fry start climbing the walls on a rainy day, the Cape Cod Children’s Museum (577 Great Neck Rd. S., 508-539-8788) may be the solution. With 20 interactive exhibits for children from 6 months to age 8, the museum engages even the most antsy kid. All ages gravitate to the pirate ship in the middle of the facility. Mashpee has only one saltwater beach, but it’s a doozy. South Cape Beach (Great Oak Rd., 508-457-0495) is a state park with a mile-long white sand beach and hiking trails through woodlands that are dotted with a few kettle ponds. The newly constructed boardwalks make beach access especially easy, and big-tire beach wheelchairs (with fishing pole holders) are also available. The swimming is matched only by the surfcasting (saltwater fishing permit required), especially on the west end near the inlet to Waquoit Bay. More than a mere shopping center, Mashpee Commons offers a re-imagined downtown for Mashpee, where women seeking stylish clothes can shop boutiques like Resort (13 Market St., 508-681-0446) as well as larger chains, and foodies with a craving for French bistro fare can dine on pan-seared dayboat haddock with absinthe caper butter at Bleu (10 Market St., 508-539-7907). Home of the traffic circle where Rtes. 6 and 28 converge, the “elbow” of Cape Cod is dotted with bogs and ponds. Go early to Cottage Street Bakery (5 Cottage St., 508-255-2821) before the cinnamon-dusted “dirt bomb” pastries sell out. Then grab a parking space at Nauset Beach (250 Beach Rd.) where breakers boom on a beach backed by high dunes. Skim the wash on a boogie board, or head farther down the 10-mile-long beach to surf or cast for stripers and blues (saltwater fishing permit required). Off the beach, visit a slice of history at the French Cable Station Museum (41 S. Orleans Rd., 508-240-1735), where a 3,200-mile telegraph cable to France was installed in 1898, making it a key pre-radio link to Europe. During World War I, General Pershing in France communicated with strategists in Washington through the cable station. The Sparrow Store (26 Main St., 508-255-9400), where one of the co-owners is ukulele maestro Tim Sweeney, will put a smile on your face. Its comprehensive selection of kitschy mugs and T-shirts is augmented by ukuleles and uke instruction manuals. The shop is the self-proclaimed “official gift store” of the Hot Chocolate Sparrow (5 Old Colony Way, 508-240-2230), the espresso and chocolate institution around the corner with great pastries. Nauset Marsh is an underappreciated wonder—an ecosystem with its own tides, schools of fish, colonies of shellfish, and abundant birdlife. Explore its tranquil waters by paddling a kayak that you can rent from outfitter Goose Hummock (15 Rte. 6A, 508-255-0455). There’s great seafood (naturally) at Rock Harbor Grill (18 Old Colony Way, 508-255-3350), but the real finds at this cozy tavern are the wood-fired brick-hearth pizzas and meat dishes such as grilled bratwurst or bistro steak. Spend the morning in the broad light of the wilds of the Cape Cod National Seashore. After breakfast, pedal west out Bradford Street on the dedicated bike lanes to Herring Cove Beach via the Provincelands Road. Follow the Province Lands Bicycle Trail through the undulating dune system as you head for the Province Lands Visitor Center and its great observation deck. Coast down the spur to Race Point, where you might spot whales feeding offshore, and visit the Old Harbor Life-Saving Station’s museum for an overview of heroic rescues that were once almost routine on Cape Cod. Back in town, try the clam or seafood chowder at the Lobster Pot (321 Commercial St., 508-487-0842). Then wander down the pier to the Whydah Pirate Museum (16 MacMillan Pier, 508-487-8899), where salvaged treasure from the 1717 wreck of the Whydah relates pirate history in these waters and explains a bit about underwater archaeology. Boutique temptations abound on Commercial Street, but P’town’s greatest strength is visual art. The town has more than 40 art galleries (www.provincetowngalleryguide.com), most of them opening at midday. Several also hold open houses with enticing snacks on Friday evenings. The heart of the art scene is the Provincetown Art Association and Museum (460 Commercial St., 508-487-1750). The permanent collections give a great overview of the development of the art colony. Conclude the daylight hours with a sunset tour from Art’s Dune Tours (800-894-1951), a one-hour drive through the huge rolling dunes of the Cape Cod National Seashore, past the few remaining artists’ dune shacks. Twilight lingers in midsummer, and the P’town streets are alive with folks making the evening promenade. If you made reservations at Jimmy’s Hideaway (179 Commercial St., 508-487-1011), linger over Portuguese cod with linguiça and a bottle of wine. A view of the ocean in Provincetown. If it’s a Wednesday, get an early start on the day by perusing the tables of 80-140 dealers at the Sandwich Bazaar (Oakcrest Cove Field, 34 Quaker Meeting House Rd., 508-685-2767). The flea market starts around 6 a.m., and wraps up by noon. You probably won’t find a choice piece of historic Sandwich Glass, but you can see great examples—as well as hourly glassblowing demonstrations—at the Sandwich Glass Museum (129 Main St., 508-888-0251), which chronicles the town’s history with pressed glass. It also has an excellent gift shop. (1 Water St., 508-833-2485), but it does help to like scones, curried chicken salad, and cucumber sandwiches—or any of 150 different teas. Sandwich was founded because its extensive salt marshes guaranteed fodder for livestock. Nearly four centuries later, those swaying marshes provide a dramatic approach to Town Neck Beach (Town Neck Rd.). Watch for redwinged blackbirds on grass plumes as you cross the long boardwalk over the marshes to the foot of the sand dunes. Once on the beach, enjoy gentle waves for swimming or sit and watch vessels plying the Cape Cod Canal. If you’d rather save the beach for another day, spend the afternoon at Heritage Museums & Gardens (67 Grove St., 508-888-3300). The garden paths are lined with the most extensive blooms on the Cape. The dogwoods are finishing, the daylilies are starting, and the summer perennials are popping all over. Museum exhibits range from an exhibition on movie costumes to a 1934 Bentley Derby to the unfailing fun of the 1908 Looff carousel. To get above it all, opt for treetop adventure on aerial trails and ziplines in the Adventure Park (reserve ahead). More than half of Truro lies within the Cape Cod National Seashore, so days often focus on the beach. Corn Hill Beach got its name because Pilgrims found (and liberated) a cache of corn stored here before they sailed on to Plymouth. The rolling hummocks of the town-owned beach might look familiar because Edward Hopper summered above the dunes of this bayside beach and often painted the neighborhood. On the wilder Atlantic side, Head of the Meadow Beach has great surfing where big rollers break on offshore sandbars. Cape Cod’s first lighthouse was Highland Light (27 Highland Light Rd., North Truro, 508-487-1121), built in 1797 atop cliffs that tower more than 100 feet above the Atlantic Ocean. The current tower was built in 1857 and was moved 450 feet back from the cliff in 1996. Sixty-nine steps wind to the top, where the view stretches 20 miles on a clear day. Nearby, the Highland House Museum (6 Highland Light Rd., North Truro, 508-487-3397) preserves a 1907 resort hotel as a historical museum. Don’t miss the shipwreck artifacts. Also next to the lighthouse, Highland Links Cape Cod (10 Highland Light Rd., North Truro, 508-487-9201) dates from the late 19th century, making it one of Cape Cod’s first golf courses. It’s a Scottish-style links, right down to the windswept rough and the ocean views. After a round, you can visit nearby Truro Vineyards (11 Shore Rd., North Truro, 508-487-6200) for a wine tasting. North Truro also has two of the town’s more unusual shops. Chequessett Chocolate (8 Highland Rd., North Truro, 774-538-6249) starts with cacao beans and hand-crafts its chocolate from scratch. If a bar seems too staid, try a mustache-shaped chocolate on a stick—the mustache pop. Cooks always flock to Atlantic Spice Company (2 Shore Rd., North Truro, 508-487-6100), which sells more than 250 herbs and spices from bulk bins. For more local flavor, order the panko-crusted sole or butter-poached lobster at Blackfish (17 Truro Center Rd., Truro, 508-349-3399). On Wednesday through Sunday mornings, start combing the tables at the Wellfleet Drive-In Flea Market (51 Rte. 6, 508-349-0541). Up to 200 vendors hawk collectibles, bric-a-brac, art projects, jewelry, and vintage postcards—and that’s just the first row. Wellfleet packs a lot of nature into a strip of land only two miles wide. At Mass Audubon’s Wellfleet Bay Wildlife Sanctuary (Rte. 6, 508-349-2615), casual naturalists should follow the Boardwalk Trail over a salt marsh to the tidal flats. Watch for northern harriers cruising the marsh for prey, as well as whimbrels—large brown sandpipers—fattening up for the flight to their South American wintering grounds. Great Island Trail (Chequesset Neck Rd.) is a more challenging hike on the peninsula—an island until 1831—on the north end of Wellfleet harbor. The trail crosses marsh and woodlands en route to Jeremy’s Point. A side loop leads to the archaeological site of the 18th century pirate hangout, Smith Tavern. Wear good hiking shoes and count on a three-hour round trip. Twice a day, Lisbeth Chapman offers her Hopper House Tours (508-479-1033) to the houses and landscapes in Wellfleet and Truro that Edward Hopper painted in the early 1930s. The two-hour car ride with entertaining anecdotes covers locations of 31 paintings. Wellfleet’s best surfing beaches—White Crest Beach (Ocean View Dr.) and Cahoon Hollow Beach (Cahoon Hollow Rd. )—lie at the bottom of 75-foot dunes. White Crest usually has bigger surf and fewer people, but Cahoon Hollow has the Beachcomber (1120 Cahoon Hollow Rd., Wellfleet, 508-349-6055), a rock and roll bar serving fried food and cold beer. Dinner is most fun at Mac’s on the Pier (265 Commercial St., Wellfleet, 508-349-9611) where a basket of oysters goes nicely with an incredibly colorful sunset. If all the tables are taken, plunk down on adjacent Mayo Beach (Kendrick Ave.). Wellfleet Harbor Actors Theater (2357 Rte. 6, Wellfleet, 508-349-9428), the company known for provocative and often challenging plays, is concluding its summer season with a 2015 play called “Alabama Story” that pits a librarian against a segregationist politician in 1959 Montgomery. Yarmouth’s personality splits between the sober-sided world of Yarmouthport along the Old King’s Highway and the Cyndi Lauper psyche (“Girls Just Wanna Have Fun”) of West Yarmouth and South Yarmouth along Route 28. Start the day on the mild side with a stroll across the salt marsh on the Bass Hole Boardwalk (end of Center St., Yarmouthport) to Gray’s Beach. The picnic tables here are great for leisurely nature-watching over breakfast. Try almond croissants or old-fashioned sticky buns from Happy Fish Bakery (173 Main St., Yarmouthport, 774-994-8272). This beach is particularly good for small children. The Edward Gorey House (8 Strawberry Lane, Yarmouthport, 508-362-3909) preserves the droll, macabre wit of the illustrator and author whose iconic Gashlycrumb Tinies forever rescued the alphabet book from nursery rhyme insipidness. His nearby favorite bookstore, Parnassus Book Service (220 Main St., Yarmouthport, 508-362-6420), even has a special Gorey section among its impressive selection of collectible volumes. All this exercise works up an appetite. For supper, try nearby Skippy’s Pier 1 (17 Neptune Lane, South Yarmouth, 508-398-9556) which serves classic linguine and clams and lots of bottled beers. The marina view from the deck just doesn’t quit.